IPv6 for LAN is an unique feature that allows you to update your LAN's IPv6 addresses, asigned on devices that cannot run a dynamic DNS client (like NAS, Sensors, RIPE probe, etc. ), simply by running our duiadns router client (see the image below) on your CPE. The router will update IPv6 addresses for the LAN hosts behind it if there are MAC entries added in web interface for those hosts. 5. 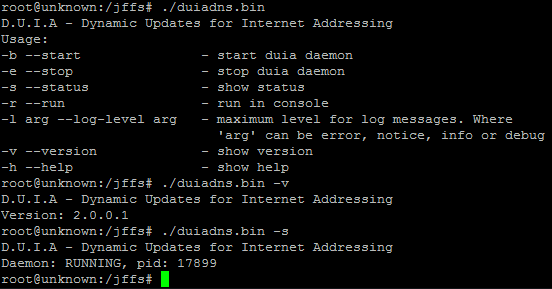 I've set up my duiadns router client daemon to start at boot on my home router. And this is how 'ipv6 for lan' feature works! Do you use it?